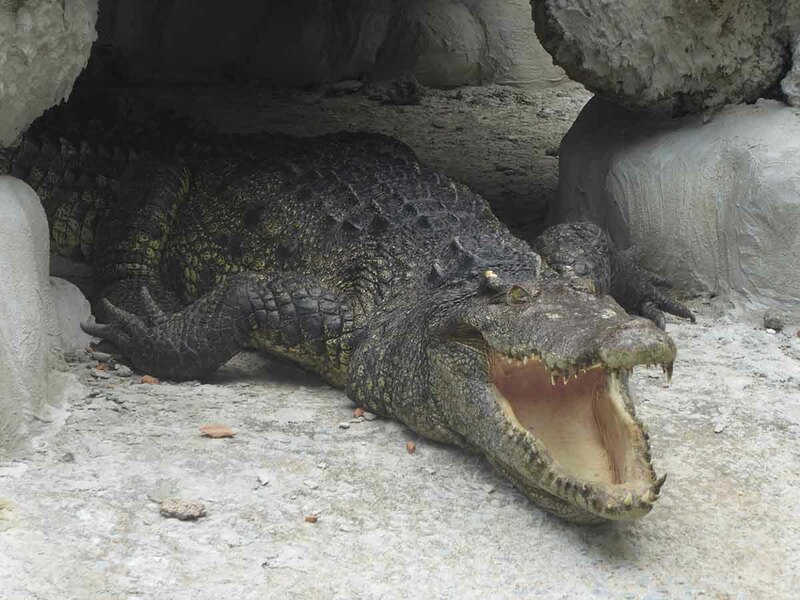 Wat Chakrawat is famous for its family of resident crocodiles who inhabit a cave and pond in the grounds. According to legend, during Ayutthaya period Thailand, the Chao Praya river was inhabited by crocodiles. One of which was a fearsome one-eyed man-eater nicknamed Ai-bod. 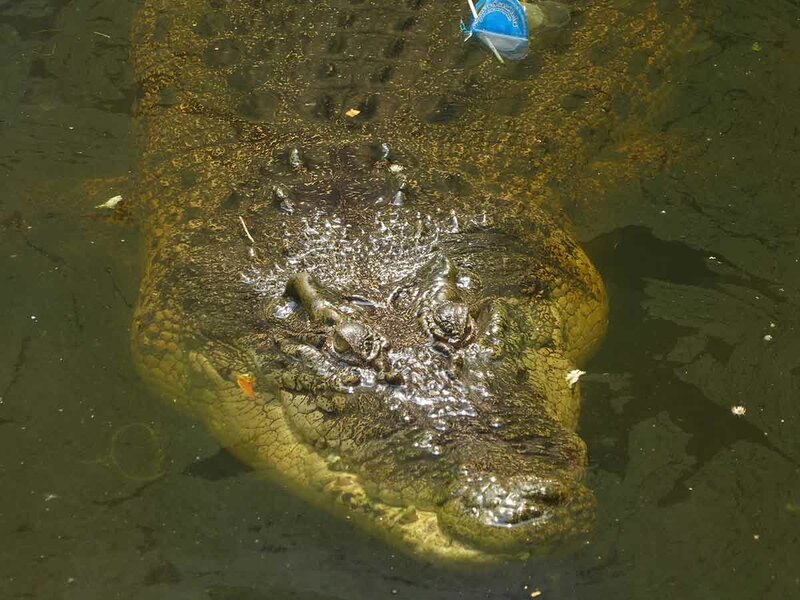 The croc was eventually hunted down by irate locals. 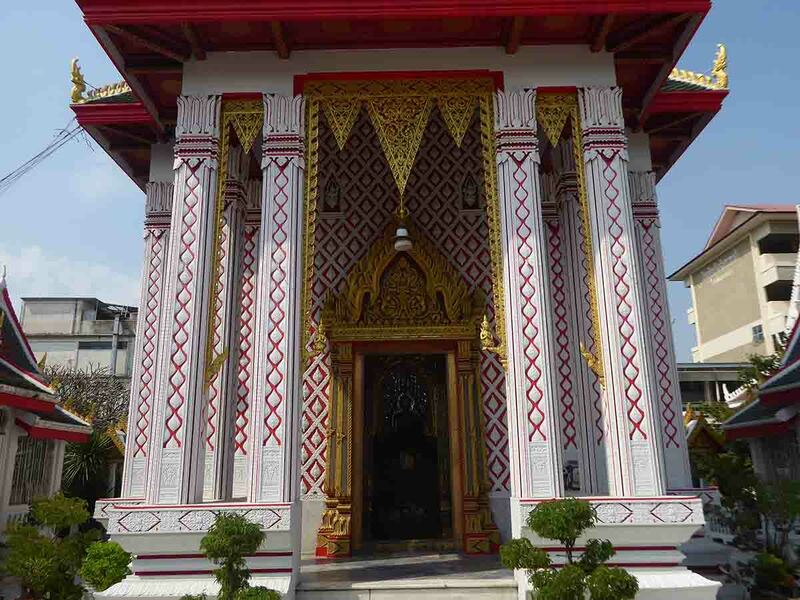 Ai-bod took refuge under a monk’s house in the temple which was known as Wat Sam Pluem at the time. The monks spared the croc and built an enclosure for it where Ai-bods ancestors continue to live today. When Ai-bod died, he was stuffed and placed on a stand by the mondop overlooking the pond. There are currently 4 crocs at the temple one of which (the mummy) is rather large. Crocodiles aren’t the only unique feature of the temple. 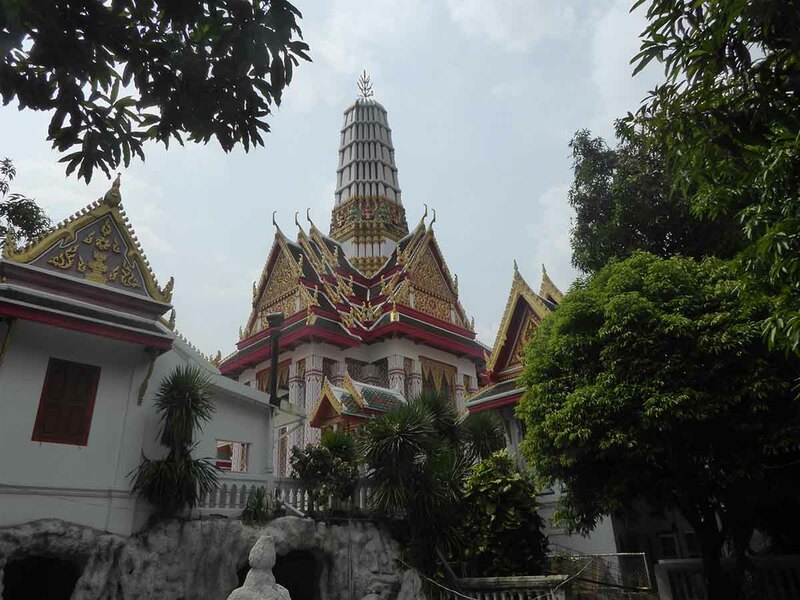 The temples ubosot, unlike others, faces westward towards the Emerald Buddha at the Grand Palace. When entering the temple, there is a staircase to the left leading to a platform containing a mondop and prang. 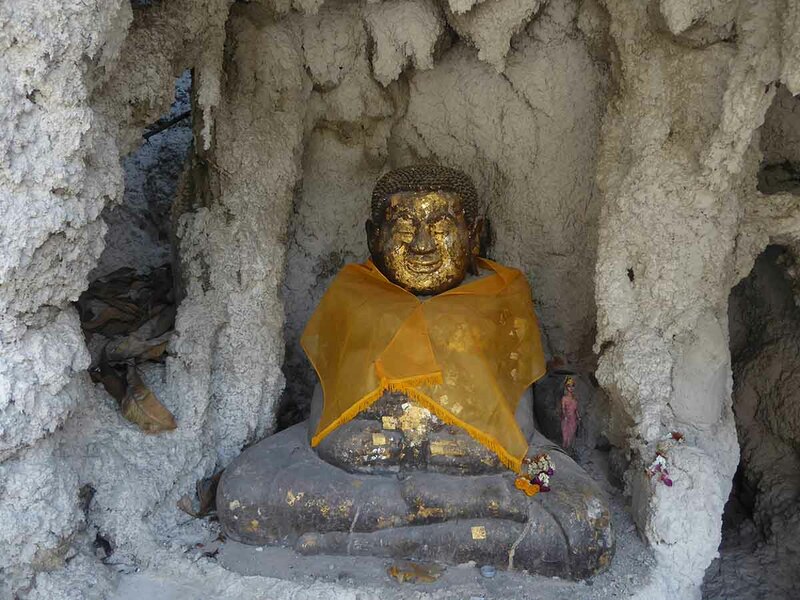 The mondop contains a relic of the Buddha’s footprint. The stuffed Ai-bod can be found next to the mondop. Elsewhere in the compound is a large concrete grotto that resembles a termite mound. 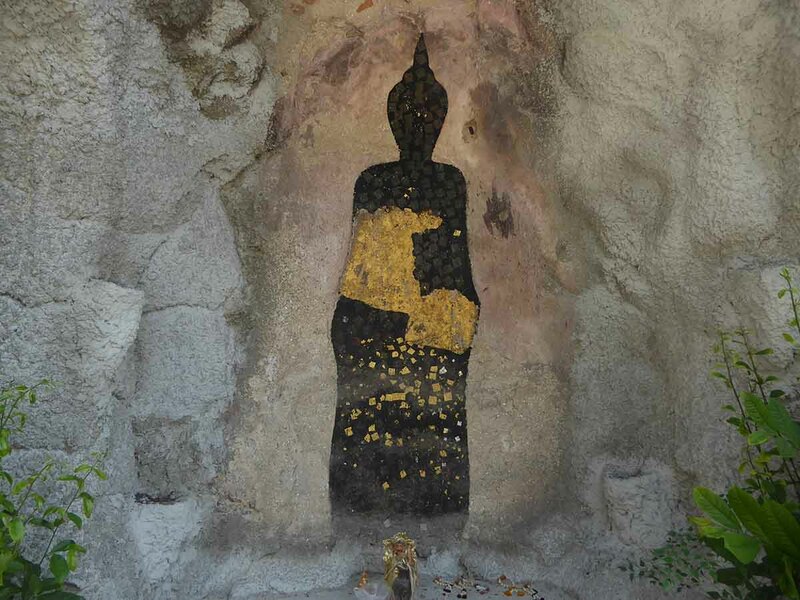 Inside on the wall is a black Buddha shadow to which worshippers pray and affix gold leaf. 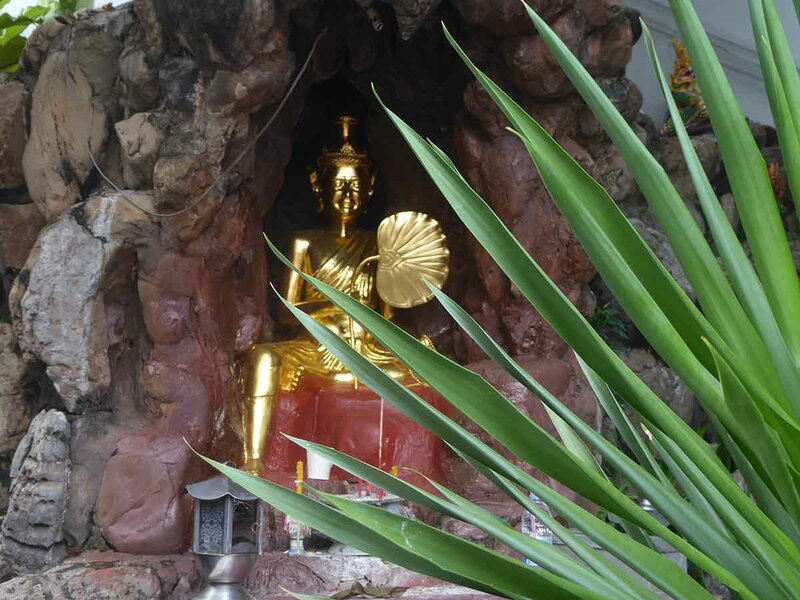 Nearby are a reclining Buddha image and a small statue of a fat monk. According to legend, the fat monk was once a slim, handsome monk who attracted the attention of lusty local females. As all interaction with women was strictly taboo the monk solved the problem by gorging himself on food. He became very fat and thus no longer attractive. Boat: Chaopraya Express Boat to Ratchawong Pier (N5). From the pier, walk up Ratchawong road and turn left at the first small alley. The entrance to the temple is where the alley makes a sharp turn to the right. 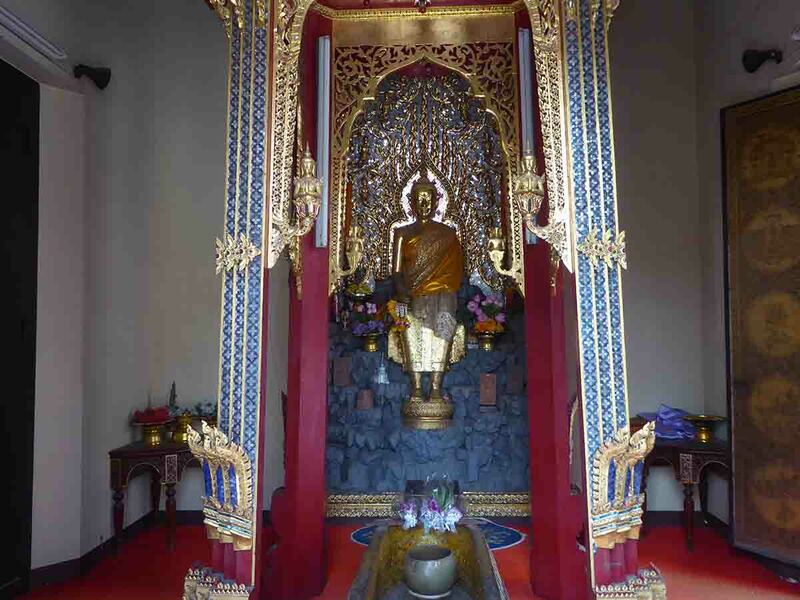 You must walk by the temple’s school and living quarters to reach the main compound. If you’re walking up Yaowarat road or Sampeng lane towards Phahurat, turn left on to Chakrawat road. The entrance is on the left through a car park.